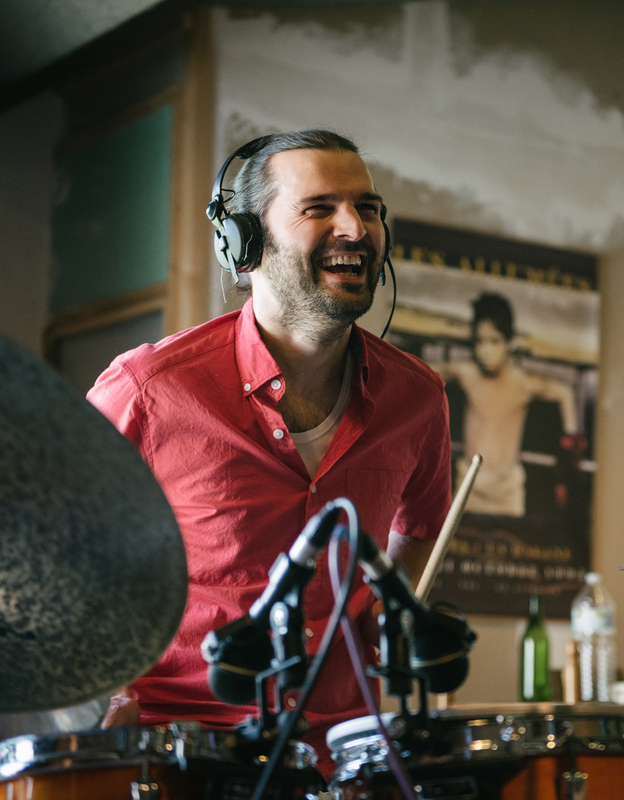 Florian Chaigne studied first Classical percussions, then started drum set as autodidact within several Rock and Metal bands. He studied Jazz, drums, piano, composition, etc. at the Conservatory of Nantes (France). Since 2006, he invested himself in a bunch of projects as ATom, Mathieu Lagraula Trio, Andrew Audiger Trio, Greg Évain Trio, Rémy Hervo Trio, Flex!, MiRage, R.A.T., etc. He has performed in Ireland, UK, Spain, Switzerland, Belgium, Netherlands, Sweden, India, China with various projects, sharing the stage with Shai Maestro, Trilok Gurtu, Paolo Fresu, Omar Sosa, Jasper Blom, Minino Garai, Jacky Terrasson, Anne Paceo, etc. He has had the fortune of collaborating with: Ghatam Giridhar Udu-pa, Nelson Veras, Leila Martial, Geoffroy Tamisier, David Cheval-lier, Patrick Charnois, Will Guthrie, Toma Gouband, etc. He founded projects as leader/composer such as Pulse (funk), DüH, KETU (hybrid jazz/rock/world), and then more recently Colu-nia (jazz chromatic harp band) in still drawing his inspiration from foreign cultures and especially oriental ones. He is the co-founder of the collective « Spatule ». He is currently involved with several musical projects as Farows, Julien Vinçonneau 4tet, Doucha, and also of some cross-disciplinary projects as Le Vanneau Huppé (contemporary dance & music), Jazz Poetry Improvisation Ensemble, etc. He released recently his first album under his own name which is called « Blooming » out on Aut Records in 2016.